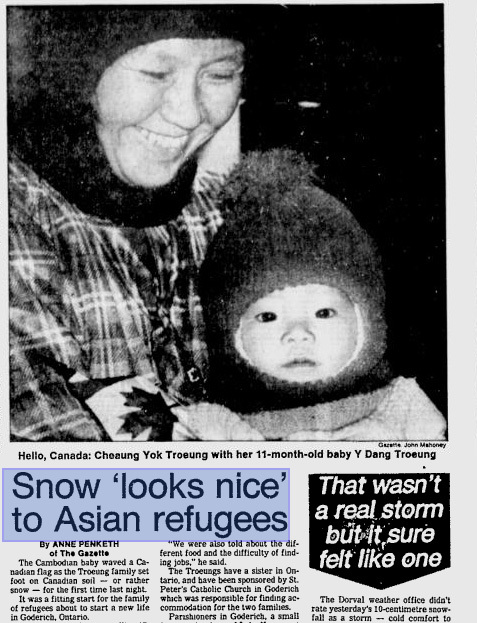 “Snow Looks Nice to Asian Refugees”, The Montreal Gazette, Dec 4, 1980. My parents named me after camp Khao I-Dang, the refugee camp where I was born. They did so to remember their survival, and those international aid workers who cared for them after an improbable escape from the labor camps in Cambodia, across the landmine-riddled jungle, to the border of Thailand. As difficult and confusion-inducing as my name is, I wonder now how my life would have turned out, had they had named me “Goderich” after the small Canadian town where a kind group of sponsors first pooled their resources to bring us to Canada. Or if they had named me “Trudeau,” after the man who held me as an infant when my family first arrived in Canada, the man who is the centerpiece of my family’s postcard-perfect photograph commemorating our arrival. I think of this picture often. Prime Minister Pierre Trudeau welcoming my family to Canada at a ceremonial tea party on Parliament Hill. Why were we chosen, why were we given prestige for this photo? My family was not just any refugee family Canada had taken in. Arriving on December 3, 1980, we were designated the last, the “final” Southeast Asian refugees admitted under the special government program. But of course there was ongoing need, ongoing suffering. The war in Cambodia continued for another 18 years, yet we were the last. And as the last, we were to symbolize something more than just gratitude. We were proof that Canada had fulfilled its quota, had checked “saved refugee” off the good karma list. We were to be the symbol that Canada had done what it was charged to do, and needn’t be asked to do more. The scholar Sara Ahmed speaks of the “Happiness Duty” of the migrant, which means “telling a certain story about your arrival as good, or the good of your arrival.” With my family living in poverty, and haunted by the knowledge of those left behind, I had difficulty performing this duty. I remember re-living my family’s experience as a child. I remember the words thrown my way. “Genocide” was not an accurate definition of what happened, I was told. “Death” was too heavy for a child to say. But I could say “tragedy.” I could talk about how terrible war was. War in the abstract, as if what happened to us was an abstract thing. The recent photo of a deceased Syrian refugee child has gone viral, it has motivated movements and pushed demands for the migrant crisis in Europe to be met not with suspicion and refusal, but with compassion and care. The global moral eruption that has been stirred by the circulation of one photograph is a feature that those who suffered from the Pol Pot regime did not have. There were so few foreign witnesses to the atrocities, and little to no photographs emerged from that time. Instead, to remember the genocide we have numbers. Figures of the deceased, and mere figures refuse to inspire the same collective mourning. Last year was the greatest refugee crisis in European history. This year, we have far surpassed last year’s numbers. Like in 1979, for so long all we gazed upon were these figures, some that grip the imagination by their sheer volume, yet each number is a story, a mourning, a loss. All the while, to remember losses that Cambodians endured all I had were the numbers people tossed. The counting of every breath of life, when it stopped, when it ended. If we allow it, there is another number that can grip our imaginations. 10,000, the number of Syrian migrants that Canada promised to secure in January 2015, 8998 of which it has so far failed to meet. I would not be here had Canada not met its goal of 60,000 Southeast Asian refugees in 1980. I would not be here without compassion. That of Canadian citizens who petitioned the government to do more about the refugee crisis, who marched in the streets of Toronto in 1979 in support of Operation Lifeline, who set up a community fund to help my family buy food during our first few months in Canada. My history is proof that there is compassion and love. Now we are meant to de-prioritize compassion. We are meant to put love on hold, because we showed it to others in the past, because it burdens us in the present. But the good of the past does not permit the indifference to the now. The Canada that I believe in is a Canada where there is never a last refugee. Y-Dang Troeung lived in Canada from 1980-2012. She is now an Assistant Professor of English at City University of Hong Kong. ZHUANG Wubin (b. 1978; Singapore) is a writer, curator and artist. 1. This is a group writing blog. 2. Invited writers are asked to contribute reflections and thoughts on photographic practices. They can also offer reviews of exhibitions or respond to previous postings. 3. Our region of interest is Southeast Asia (SEA). At the same time, we understand the need to use this geographical label with critical distance. 4. Contributors are encouraged to illustrate their postings with visuals. 5. Contributors are encouraged to write clearly and succinctly. 6. This is not an academic blog. 7. This blog is managed by Zhuang Wubin.